South Gallia junior A.J. 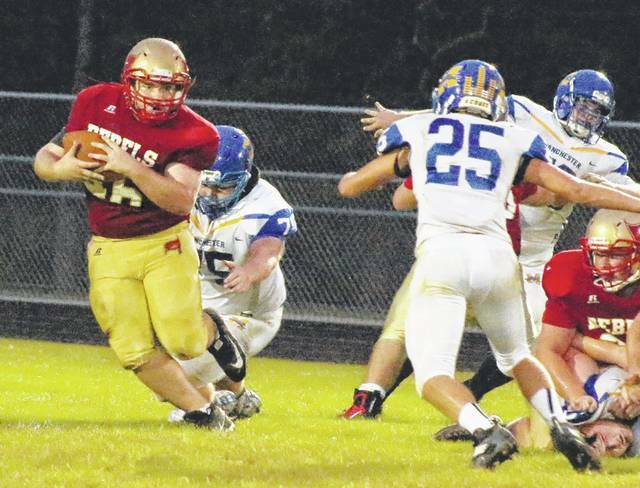 Woodall, left, avoids a pair of Manchester defenders during a first half carry Friday night in a Week 4 non-conference football game in Mercerville, Ohio. MERCERVILLE, Ohio — The difference was in the defense. South Gallia scored 14 points off of three Manchester turnovers and never trailed Friday night during a hard-fought 34-28 victory in a Week 4 non-conference matchup at Rebel Field in Gallia County. The host Rebels (2-2) finished the night plus-2 in turnover differential and made the most of all three of their takeaways, but two of those extra possessions proved quite beneficial over a five-minute span between the second and third quarters. Leading 14-13 with just over two minutes remaining in the first half, South Gallia sophomore Austin Day recovered a fumble at the Manchester 13 with 1:51 left. The Red and Gold needed just two plays to cash in on their good fortunes as Jeffrey Sheets hit Jacob Birtcher on a successful 15-yard halfback pass. Sviatoslav ‘Savat’ Hryhorenko added the successful PAT boot, allowing the Rebels to take a 21-13 cushion with 1:10 left before the break. The Greyhounds (1-3) started the second half with possession, but fumbled on the opening play of their first drive. Day recovered his second fumble of the night, giving SGHS the ball at the guests 28 just 11 seconds into the third period. The Rebels marched 28 yards in five plays, increasing their lead to 28-13 following a 3-yard scamper by Sheets at the 9:49 mark of the third — the hosts largest lead of the night. After both teams traded punts, Manchester put together an 8-play, 54-yard drive that resulted in a touchdown following a 4-yard run by Shaun Gould. Nick Woolard added a successful 2-point run, allowing the Blue and Gold to close to within 28-21 with 1:38 remaining in the third. South Gallia responded with a 5-play, 58-yard drive that went early into the fourth quarter. Kyle Northup capped the drive with a 6-yard run, but a failed 2-point conversion only upped the SGHS lead to 34-21 with 11:54 left in regulation. The guests countered by covering 61 yards in six plays, with Gould scoring on a 32-yard run with 9:06 remaining. Trent Dryden added a successful PAT kick to make it 34-28 early in the fourth. The Greyhounds caught their big break on the Rebels’ ensuing drive as Gould recovered a Rebel fumble, giving Manchester possession at the SGHS 26 with 9:01 left. South Gallia, however, forced a fumble and regained possession just five plays later as Austin Stapleton fell on the loose ball at the hosts 22 — bringing the offense out with 5:01 remaining. The Rebels strung together an 11-play drive that included four first downs while eating up the remainder of the clock, allowing the Red and Gold to sneak away with the six-point triumph. South Gallia outgained the Greyhounds by a sizable 389-257 overall margin in total yards of offense, but the guests claimed a 127-84 edge in the second half. MHS also outscored the Rebels 15-13 in the second half, with seven of those SGHS points coming off of a turnover. The hosts also battled both cramps and injuries down the stretch, which included not having Sheets — South Gallia’s main work horse — available on offense over the final eight minutes regulation. Yet, through all of the trials and tribulations, the Red and Gold found a way to finish out the game and pick up their second home victory of the year. SGHS first-year coach Mike Smith noted that he was nervous about his young troops down the stretch, but he also acknowledged just how much growth his kids showed over the course of 48 minutes on Friday night. As he said, it was a positive step in the right direction. “I thought we had some adversity tonight, but I thought our kids handled it well. You worry about things like that with a young team, but I was really proud of how well they kept battling through the tough times,” Smith said. “I really thought that our defense was the difference in the game. We gave up some plays, but we did a good job of containing their offense when we needed to and those takeaways were a big help to what we did tonight. The Rebels took the opening kickoff and marched 80 yards in nine plays while taking a 7-0 advantage. Sheets capped the drive with a 37-yard run at the 7:11 mark and Savat added the PAT kick. Both teams traded punts, then Manchester strung together a 5-play, 81-yard drive that tied things up following a Mason Bilyeu 30-yard scamper on an option pitch. Dryden booted the PAT through for a 7-all tie with 9.5 seconds left in the opening frame. South Gallia answered with an 8-play, 65-yard drive that ended with a Northup 1-yard run, allowing the hosts to reclaim a 14-7 cushion with 8:37 remaining in the first half. MHS, however, came right back with a 3-play, 68-yard drive that ended with a 73-yard run by Woolard. South Gallia’s Justin Butler blocked the PAT kick attempt by Dryden, allowing the Rebels to hold on to a slim 14-13 lead with 6:48 left until halftime. The hosts marched down to the MHS 27 on their next drive, but a 45-yard field goal attempt by Savat ultimately came up short of its mark — giving the Greyhounds possession at their own 27 with 3:03 remaining. Two plays later, South Gallia came away with its first of three takeaways on the evening. The Rebels claimed a 19-11 edge in first downs and were also penalized nine times for 95 yards, while the guests were flagged five times for 21 yards. Sheets led the SGHS ground attack with 167 yards on 19 carries, followed by Northup with 103 yards on 20 totes. A.J. Woodall also had eight attempts for 29 yards. Northup finished the game 3-of-5 passing for 60 yards, while Sheets was 1-of-1 for 15 yards and a score. Birtcher led the hosts with three catches for 57 yards. Bilyeu paced Manchester with 85 rushing yards on 12 carries, while Gould had 83 yards on 13 attempts and Woolard added 72 yards on 11 tries. Gould was 1-of-3 passing for 17 yards, with Marcus Neeley hauling in the lone grab for 17 yards. The Rebels return to action Friday when they host Eastern in a Week 5 TVC Hocking football contest at 7:30 p.m.